Life in Mayfair is a little sweeter thanks to the opening of Factory Donuts. Sitting outside the newly opened Factory Donuts in Mayfair, owners Heather and David Restituto are excited about the store’s location at 7114 Frankford Ave. It’s diagonal from Stein Your Florist, and as customers come and go up and down the busy street, it reminds them of when more people visited the area. “Frankford Avenue was the spot to be,” David said. With plenty of hope and a dash of luck, they hope Factory Donuts could help bring back that feeling. The store opened its doors Aug. 18 after two years of obtaining approvals and incubating ideas. Walking into the store, it’s clear the Restitutos took its name to heart. It has a wide-open layout with a high ceiling and pendant lighting, built to resemble a factory (Heather said the design is inspired by places in Northern Liberties). 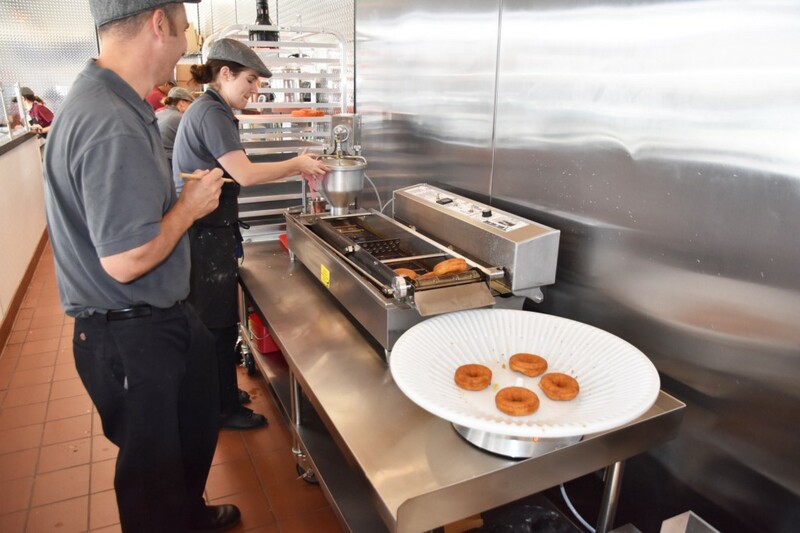 Customers walk to the right to place their order, then stand in line and watch their doughnuts being made. Batter is dispensed onto a machine that sends the doughnut sailing down a river of oil. When both sides are fried, icing and toppings will be added — with customer input. Though the menu currently offers 23 flavors (with promises of seasonal variations), customers are able to mix and match icings and ingredients to cultivate their dream pastry. The display of brightly colored icings behind the counter is certainly tempting to experiment with. Only the strong-willed will not be tempted to sample items from the menu, though, which features classics like vanilla factory and cinnamon sugar, to more inventive flavors like banana foster, strawberry lemonade and lemon meringue. Heather is the mastermind behind the flavors. The Restitutos are enthusiastic hosts for friends and family, and Heather’s cooking, particularly her doughnuts, earned rave reviews. “We would have visitors come over, and they would ask me, where’s the doughnuts,” Heather said. The menu came about from Heather’s experimenting in the kitchen. The lemon meringue pie flavor, for example, was invented because David’s grandmother loves the flavor. The couple have previously worked in business in Mayfair, but this is the first venture opening their own business. They said the reaction from neighbors has been positive in its first two weeks. David recalled a woman who told him that when she bit into her doughnut, it took her back to her childhood. “It’s more rewarding than I anticipated,” he said. To help greet the neighbors, the store hosted an eclipse party on the day of the solar eclipse, its third day of operation. They gave out free sunglasses and doughnuts and enjoyed the rare view. Though it’s only been a matter of weeks, the Restitutos are already looking toward the future. They hope to raise funds for children and families impacted by hydrocephalus, a condition where infants are born with too much fluid in their brain, which can lead to lifelong issues. Heather said her own child had the condition, and she hoped to become involved with raising funds by the end of the year. In the meantime, the Restitutos have their plates full.